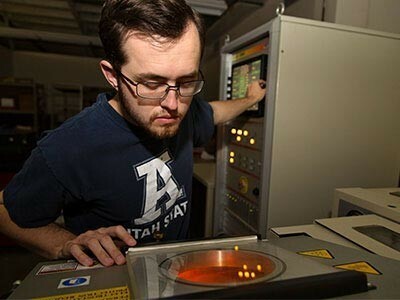 Our research focus is in the mechanical characterization of solids and structures in challenging environments, and at high temperatures in particular. We are especially interested in the role that environment plays on a material's ability to withstand heterogeneous failure mechanisms such as fracture, fatigue, and creep. Our lab uses advanced imaging techniques to extract full-field, in situ strain and temperature measurements across multiple length scales. 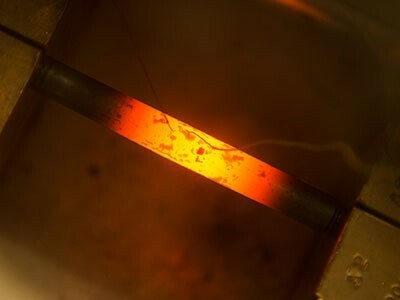 These techniques are applied to a wide variety of advanced high temperature materials (including metals, ceramics, and composites), with applications geared towards the energy, aerospace, and nuclear industries. April 17, 2019: Robert's paper, "A high magnification UV lens for high temperature optical strain measurements" is available from Review of Scientific Instruments. April 15, 2019: Ashley Nielson is accepted into USU's Engineering Undergraduate Research Program (EURP). Congratulations Ashley! April 10, 2019: Katharine Burn is recognized as Undergraduate Researcher of the Year for the whole College of Engineering. Congratulations Katie! April 9, 2019: Dr. Berke is recognized as Undergraduate Research Mentor of the Year for the entire university! He is deeply honored. April 5, 2019: Profs. Berke and Liu partner with INL and UCSB to map irradiation-induced swelling against the unique microstructures of nuclear fuel pellet specimens. Mar 4, 2019: Adam Smith is awarded a fellowship from the NEUP Integrated University Program. Congratulations Adam!